The versatile 5" Smash Tail has a ringed body and lifelike swimming action perfect for a variety of presentations. Whether rigged on a belly weighted hook, jig head, as a swim jig trailer, or an umbrella rig, it is sure to become your go to swimbait! The 3.5" Smash Tail Jr has a ringed body and lifelike swimming action perfect for a variety of presentations. Whether rigged on a belly weighted hook, jig head, as a swim jig trailer, or an umbrella rig, it will become one of your favorites! 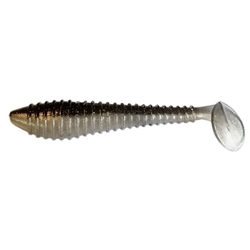 Perfect for when you are wanting a smaller baitfish profile!